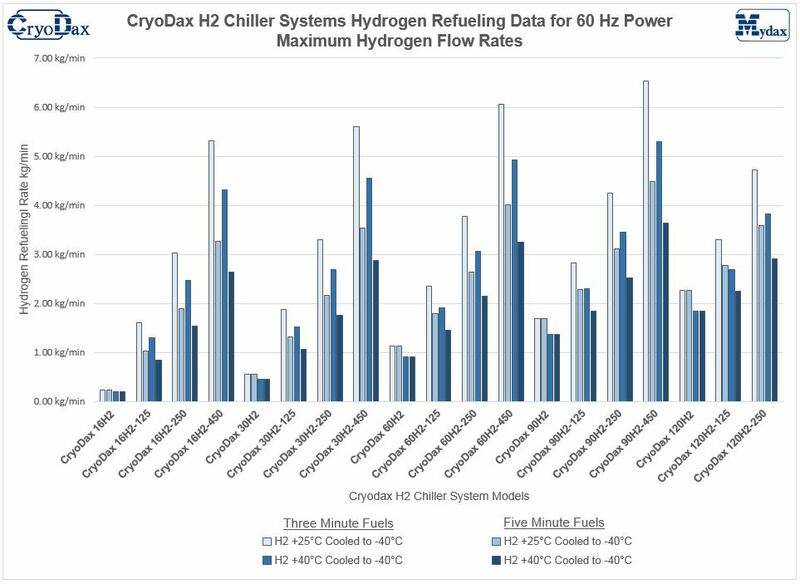 CryoDax H2 Low Temperature Liquid Chiller System and Hydrogen Precooler MCHE Micro Channel Diffusion Bonded Stainless Steel Heat exchanger. 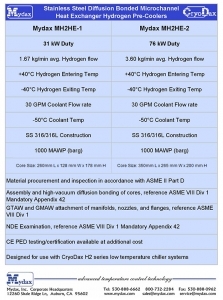 Excellent choice for SAE J2601 H70-T40 H2 FCEV Hydrogen automotive refueling precooler / cooling / chilling applications. Mydax chillers are used for hydrogen pre-cooling in automotive hydrogen refueling station applications for FCEV Hydrogen Fuel Cell Electric Vehicles. 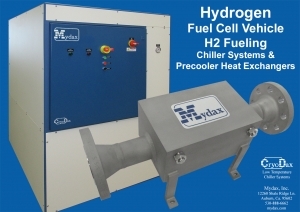 With our CryoDax series of low temperature chiller systems, Mydax provides the largest cooling capacities below -40°C available anywhere, which makes them an excellent choice for Hydrogen Refueling Station Applications! 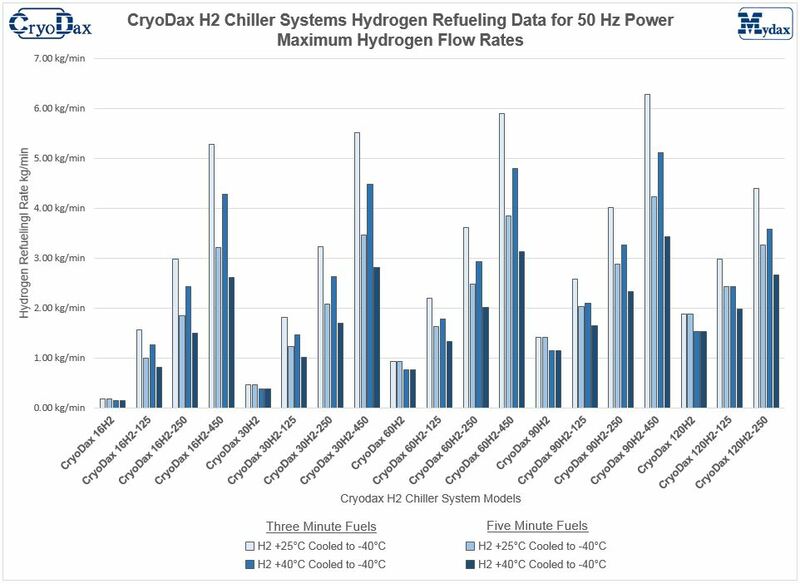 Our CryoDax H2 systems are designed specifically for hydrogen refueling applications as these systems utilize our CryoDax low temperature chiller system for cooling, and we offer a selection of optional large reservoir/pump modules to provide a cooling buffer and allow reduced wait time between re-fuels. 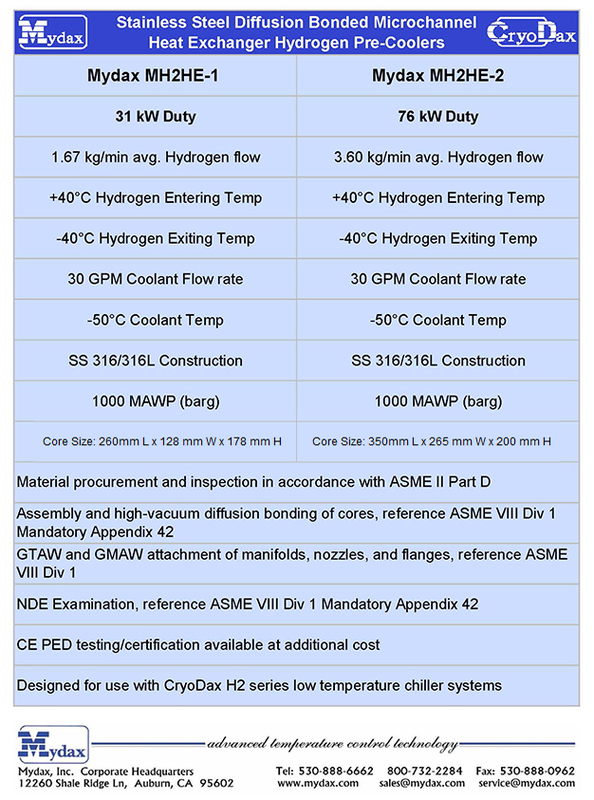 The chiller system cools the Syltherm Heat Transfer Fluid in the reservoir, and the Syltherm is recirculated from the reservoir to the H2 pre-cooler heat exchanger when H2 dispensing is in progress. 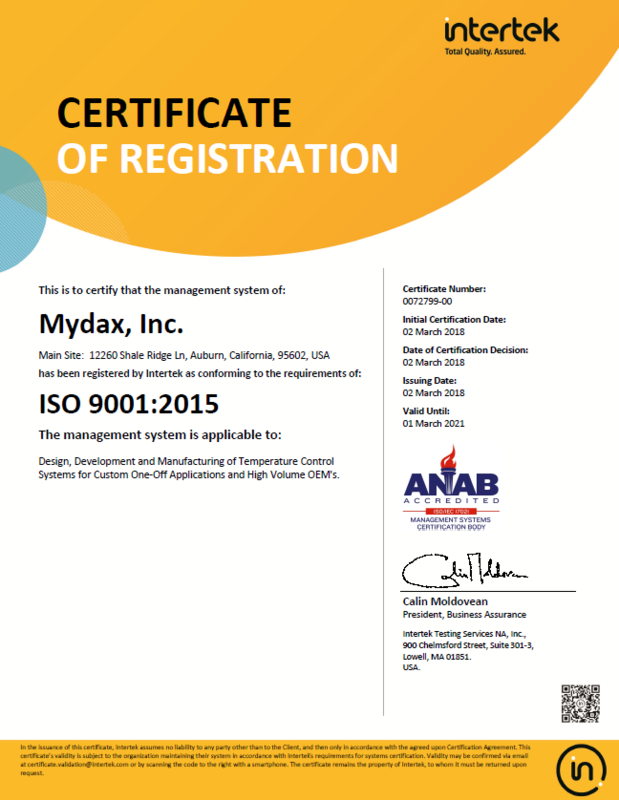 Mydax also offers Hydrogen Pre-Cooler Heat Exchanger solutions developed to work with our CryoDax H2 chiller systems. Our Hydrogen Precooler Heat exchangers are very compact MCHE Micro Channel Diffusion Bonded Stainless Steel designs that can operate at very low temperatures and very high pressures. Please contact us to discuss your application with one of our engineers.